Every month, the artist is writing her diary daily on two pages of paper using a vanishing ink pen – recollecting onto paper the day’s causal occurrences, personal thoughts, private moments and uncensored reflections as they resurfaced in her mind. Once the two white pages are covered with these ephemeral notes, she scans them before the text evaporates. In six hours, each word has slowly and organically disappeared from the page, taking away with it the weight of the content and the contribution that this daily recollection has for the present and the future. At the end of each day, all that remains are two blank, white pages, lightly marked by the pen’s etchings, waiting for the next day’s narrations. The same process is repeated each day of the month on the same two pages. 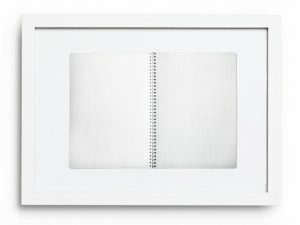 After that, the two blank pages of paper that bore the weight of the artist’s hand and personal history are framed and publically displayed while the scanned documents, the only traces that the process itself really happened, are stored on a USB key casually taped behind each frame.